It is ordinary, as lands go. Mountains and plateaus and canyons and river deltas, the usual. Ordinary, except for its size and its dynamism. It moves a lot, this land. Like an old man lying restlessly abed it heaves and sighs, puckers and farts, yawns and swallows. Naturally this land’s people have named it the Stillness. It is a land of quiet and bitter irony. The Stillness has had other names. It was once several other lands. It’s one vast, unbroken continent at present, but at some point in the future it will be more than one again. The end begins in a city: the oldest, largest, and most magnificent living city in the world. The city is called Yumenes, and once it was the heart of an empire. It is still the heart of many things, though the empire has wilted somewhat in the years since its first bloom, as empires do. Yumenes is not unique because of its size. There are many large cities in this part of the world, chain-linked along the equator like a continental girdle. Elsewhere in the world villages rarely grow into towns, and towns rarely become cities, because all such polities are hard to keep alive when the earth keeps trying to eat them… but Yumenes has been stable for most of its twenty-seven centuries. Yumenes is unique because here alone have human beings dared to build not for safety, not for comfort, not even for beauty, but for bravery. The city’s walls are a masterwork of delicate mosaics and embossing detailing its people’s long and brutal history. The clumping masses of its buildings are punctuated by great high towers like fingers of stone, hand-wrought lanterns powered by the modern marvel of hydroelectricity, delicately arching bridges woven of glass and audacity, and architectural structures called balconies that are so simple, yet so breathtakingly foolish, that no one has ever built them before in written history. (But much of history is unwritten. Remember this.) The streets are paved not with easy-to-replace cobbles, but with a smooth, unbroken, and miraculous substance the locals have dubbed asphalt. Even the shanties of Yumenes are daring, because they’re just thin-walled shacks that would blow over in a bad windstorm, let alone a shake. Yet they stand, as they have stood, for generations. At the core of the city are many tall buildings, so it is perhaps unsurprising that one of them is larger and more daring than all the rest combined: a massive structure whose base is a star pyramid of precision-carved obsidian brick. Pyramids are the most stable architectural form, and this one is pyramids times five because why not? And because this is Yumenes, a vast geodesic sphere whose faceted walls resemble translucent amber sits at the pyramid’s apex, seeming to balance there lightly—though in truth, every part of the structure is channeled toward the sole purpose of supporting it. It looks precarious; that is all that matters. The Black Star is where the leaders of the empire meet to do their leaderish things. The amber sphere is where they keep their emperor, carefully preserved and perfect. He wanders its golden halls in genteel despair, doing what he is told and dreading the day his masters decide that his daughter makes a better ornament. None of these places or people matter, by the way. I simply point them out for context. But here is a man who will matter a great deal. You can imagine how he looks, for now. You may also imagine what he’s thinking. This might be wrong, mere conjecture, but a certain amount of likelihood applies nevertheless. Based on his subsequent actions, there are only a few thoughts that could be in his mind in this moment. He stands on a hill not far from the Black Star’s obsidian walls. From here he can see most of the city, smell its smoke, get lost in its gabble. There’s a group of young women walking along one of the asphalt paths below; the hill is in a park much beloved by the city’s residents. (Keep green land within the walls, advises stonelore, but in most communities the land is fallow-planted with legumes and other soil-enriching crops. Only in Yumenes is greenland sculpted into prettiness.) The women laugh at something one of them has said, and the sound wafts up to the man on a passing breeze. He closes his eyes and savors the faint tremolo of their voices, the fainter reverberation of their footsteps like the wingbeats of butterflies against his sessapinae. He can’t sess all seven million residents of the city, mind you; he’s good, but not that good. Most of them, though, yes, they are there. Here. He breathes deeply and becomes a fixture of the earth. They tread upon the filaments of his nerves; their voices stir the fine hairs of his skin; their breaths ripple the air he draws into his lungs. They are on him. They are in him. But he knows that he is not, and will never be, one of them. “I know,” says his companion. His companion does not reply. He wasn’t really expecting a response, though a part of him hoped. He has been so lonely. But hope is irrelevant, as are so many other feelings that he knows will bring him only despair if he considers them again. He has considered this enough. The time for dithering is past. Imagine that his face aches from smiling. He’s been smiling for hours: teeth clenched, lips drawn back, eyes crinkled so the crow’s feet show. There is an art to smiling in a way that others will believe. It is always important to include the eyes; otherwise, people will know you hate them. He speaks to no one in particular, but beside the man stands a woman—of sorts. Her emulation of human gender is only superficial, a courtesy. Likewise the loose drapelike dress that she wears is not cloth. She has simply shaped a portion of her stiff substance to suit the preferences of the fragile, mortal creatures among whom she currently moves. From a distance the illusion would work to pass her off as a woman standing still, at least for a while. Up close, however, any hypothetical observer would notice that her skin is white porcelain; that is not a metaphor. As a sculpture, she would be beautiful, if too relentlessly realistic for local tastes. Most Yumenescenes prefer polite abstraction over vulgar actuality. When she turns to the man—slowly; stone eaters are slow aboveground, except when they aren’t—this movement pushes her beyond artful beauty into something altogether different. The man has grown used to it, but even so, he does not look at her. He does not want revulsion to spoil the moment. She says nothing to this. Stone eaters rarely bother stating the obvious. He’s glad, because her speech annoys him in any case; it does not shiver the air the way a human voice would. He doesn’t know how that works. He doesn’t care how it works, but he wants her silent now. Now it ripples, reverberates, in cataclysm. Now there is a line, roughly east–west and too straight, almost neat in its manifest unnaturalness, spanning the girth of the land’s equator. The line’s origin point is the city of Yumenes. The line is deep and raw, a cut to the quick of the planet. Magma wells in its wake, fresh and glowing red. The earth is good at healing itself. This wound will scab over quickly in geologic terms, and then the cleansing ocean will follow its line to bisect the Stillness into two lands. Until this happens, however, the wound will fester with not only heat but gas and gritty, dark ash—enough to choke off the sky across most of the Stillness’s face within a few weeks. Plants everywhere will die, and the animals that depend on them will starve, and the animals that eat those will starve. Winter will come early, and hard, and it will last a long, long time. It will end, of course, like every winter does, and then the world will return to its old self. Eventually. While we’re doing things continentally, planetarily, we should consider the obelisks, which float above all this. The obelisks had other names once, back when they were first built and deployed and used, but no one remembers those names or the great devices’ purpose. Memories are fragile as slate in the Stillness. In fact, these days no one really pays much attention to the things at all, though they are huge and beautiful and a little terrifying: massive crystalline shards that hover amid the clouds, rotating slowly and drifting along incomprehensible flight paths, blurring now and again as if they are not quite real—though this may only be a trick of the light. (It isn’t.) It’s obvious that the obelisks are nothing natural. It is equally obvious that they are irrelevant. Awesome, but purposeless: just another grave-marker of just another civilization successfully destroyed by Father Earth’s tireless efforts. There are many other such cairns around the world: a thousand ruined cities, a million monuments to heroes or gods no one remembers, several dozen bridges to nowhere. Such things are not to be admired, goes the current wisdom in the Stillness. The people who built those old things were weak, and died as the weak inevitably must. More damning is that they failed. The ones who built the obelisks just failed harder than most. But the obelisks exist, and they play a role in the world’s end, and thus are worthy of note. Back to the personal. Need to keep things grounded, ha ha. The woman I mentioned, the one whose son is dead. She was not in Yumenes, thankfully, or this would be a very short tale. And you would not exist. She’s in a town called Tirimo. In the parlance of the Stillness a town is one form of comm, or community—but as comms go Tirimo is barely large enough to merit that name. Tirimo sits in a valley of the same name, at the foot of the Tirimas Mountains. The nearest body of water is an intermittent creek the locals call Little Tirika. In a language that no longer exists except in these lingering linguistic fragments, eatiri meant “quiet.” Tirimo is far from the glittering, stable cities of the Equatorials, so people here build for the inevitability of shakes. There are no artful towers or cornices, just walls built out of wood and cheap brown local bricks, set upon foundations of hewn stone. No asphalted roads, just grassy slopes bisected by dirt paths; only some of those paths have been overlaid with wooden boards or cobblestones. It is a peaceful place, although the cataclysm that just occurred in Yumenes will soon send seismic ripples southward to flatten the entire region. In this town is a house like any other. This house, which sits along one of these slopes, is little more than a hole dug into the earth that has been lined with clay and bricks to make it waterproof, then roofed over with cedar and cut sod. The sophisticated people of Yumenes laugh (laughed) at such primitive digs, when they deign (deigned) to speak of such things at all—but for the people of Tirimo, living in the earth is as sensible as it is simple. Keeps things cool in summer and warm in winter; resilient against shakes and storms alike. The woman’s name is Essun. She is forty-two years old. She’s like most women of the midlats: tall when she stands, straight-backed and long-necked, with hips that easily bore two children and breasts that easily fed them, and broad, limber hands. Strong-looking, well-fleshed; such things are valued in the Stillness. Her hair hangs round her face in ropy fused locks, each perhaps as big around as her pinky finger, black fading to brown at the tips. Her skin is unpleasantly ocher-brown by some standards and unpleasantly olive-pale by others. Mongrel midlatters, Yumenescenes call (called) people like her—enough Sanzed in them to show, not enough to tell. The boy was her son. His name was Uche; he was almost three years old. He was small for his age, big-eyed and button-nosed, precocious, with a sweet smile. He lacked for none of the traits that human children have used to win their parents’ love since the species evolved toward something resembling reason. He was healthy and clever and he should still be alive. This was the den of their home. It was cozy and quiet, a room where all the family could gather and talk or eat or play games or cuddle or tickle one another. She liked nursing Uche here. She thinks he was conceived here. His father has beaten him to death here. And now for the last bit of context: a day later, in the valley that surrounds Tirimo. By this time the first echoes of the cataclysm have already rippled past, although there will be aftershakes later. At the northernmost end of this valley is devastation: shattered trees, tumbled rock faces, a hanging pall of dust that has not dissippated in the still, sulfur-tinged air. Where the initial shock wave hit, nothing remains standing: it was the sort of shake that jolts everything to pieces and rattles those pieces into pebbles. There are bodies, too: small animals that could not run away, deer and other large beasts that faltered in their escape and were crushed by rubble. A few of the latter are people who were unlucky enough to be traveling along the trade road on precisely the wrong day. The scouts from Tirimo who came this way to survey the damage did not climb over the rubble; they just looked at it through longeyes from the remaining road. They marveled that the rest of the valley—the part around Tirimo proper, several miles in every direction forming a near-perfect circle—was unscathed. Well, really, they did not marvel, precisely. They looked at each other in grim unease, because everyone knows what such apparent fortune means. Look for the center of the circle, stonelore cautions. There’s a rogga in Tirimo, somewhere. A terrifying thought. But more terrifying are the signs coming out of the north, and the fact that Tirimo’s headman ordered them to collect as many of the fresher animal carcasses as they could on the circuit back. Meat that has not gone bad can be dried, the furs and hides stripped and cured. Just in case. The scouts eventually leave, their thoughts preoccupied by just in case. If they had not been so preoccupied, they might have noticed an object sitting near the foot of the newly sheared cliff, unobtrusively nestled between a listing gnarlfir and cracked boulders. The object would have been notable for its size and shape: a kidney-shaped oblong of mottled chalcedony, dark green-gray, markedly different from the paler sandstone tumbled around it. If they had gone to stand near it, they would have noticed that it was chest-high and nearly the length of a human body. If they had touched it, they might have been fascinated by the density of the object’s surface. It’s a heavy-looking thing, with an ironlike scent reminiscent of rust and blood. It would have surprised them by being warm to the touch. Instead, no one is around when the object groans faintly and then splits, fissioning neatly along its long axis as if sawed. There is a loud scream-hiss of escaping heat and pressured gas as this happens, which sends any nearby surviving forest creatures skittering for cover. In a near-instantaneous flicker, light spills from the edges of the fissure, something like flame and something like liquid, leaving scorched glass on the ground around the object’s base. Then the object grows still for a long while. Cooling. After a time, something pushes the object apart from within and crawls a few feet before collapsing. Another day passes. Now that it has cooled and split, a crust of irregular crystals, some clouded white and some red as venous blood, line the object’s inner surface. Thin pale liquid puddles near the bottom of each half’s cavity, though most of the fluid the geode contained has soaked away into the ground underneath. The body that the geode contained lies facedown amid the rocks, naked, his flesh dry but still heaving in apparent exhaustion. Gradually, however, he pushes himself upright. Every movement is deliberate and very, very slow. It takes a long time. Once he is upright, he stumbles—slowly—to the geode, and leans against its bulk to support himself. Thus braced, he bends—slowly—and reaches within it. With a sudden, sharp movement he breaks off the tip of a red crystal. It is a small piece, perhaps the size of a grape, jagged as broken glass. The boy—for that is what he resembles—puts this in his mouth and chews. The noise of this is loud, too: a grind and rattle that echoes around the clearing. After a few moments of this, he swallows. Then he begins to shiver, violently. He wraps his arms around himself for a moment, uttering a soft groan as if it has suddenly occurred to him that he is naked and cold and this is a terrible thing. With an effort, the boy regains control of himself. He reaches into the geode—moving faster now—and pulls loose more of the crystals. He sets them in a small pile atop the object as he breaks them loose. The thick, blunt crystal shafts crumble beneath his fingers as if made of sugar, though they are in fact much, much harder. But he is in fact not actually a child, so this is easy for him. At last he stands, wavering and with his arms full of milky, bloody stone. The wind blows sharply for an instant, and his skin prickles in response. He twitches at this, fast and jerky as a clockwork puppet this time. Then he frowns down at himself. As he concentrates, his movements grow smoother, more evenly paced. More human. As if to emphasize this, he nods to himself, perhaps in satisfaction. The boy turns then, and begins walking toward Tirimo. N. K. Jemisin is a Brooklyn author who won the Hugo Award for Best Novel for The Fifth Season, which was also a New York Times Notable Book of 2015. She previously won the Locus Award for her first novel, The Hundred Thousand Kingdoms, and her short fiction and novels have been nominated multiple times for Hugo, World Fantasy and Nebula awards, and shortlisted for the Crawford and the James Tiptree, Jr. awards. 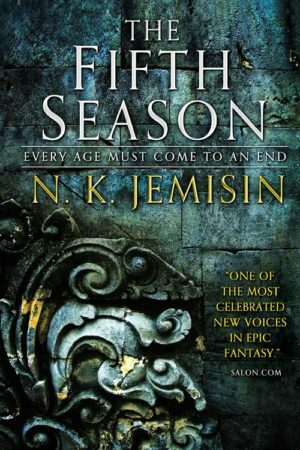 She is a science fiction and fantasy reviewer for the New York Times, and you can find her online at nkjemisin.com.